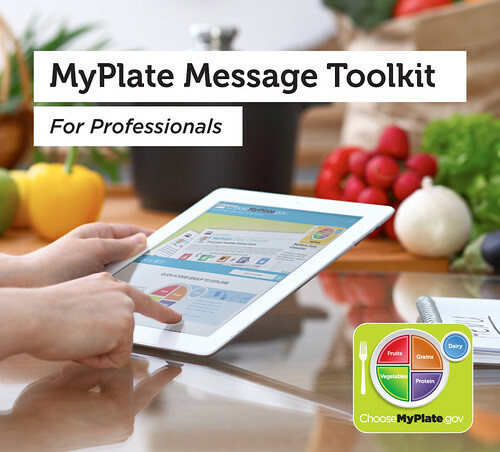 The MyPlate Message Toolkit for Professionals is available at ChooseMyPlate.gov/toolkit. As health professionals know all too well, many people establish lofty goals on January 1, only to drop their resolutions by June. One reason so many struggle may be that they incorporate extreme goals that may not be realistic. A more helpful strategy could be to start with small steps and celebrate milestones along the way. As nutrition and health professionals prepare to help their clients and patients meet their New Year’s health resolutions, MyPlate, MyWins is a great place to start. Let MyPlate, MyWins be a resource to help you assist your clients in turning resolutions into real solutions for a healthy new year. Real solutions are small, practical changes that add up to a healthy lifestyle over time. Real solutions are not meant to have an end date; they are changes that can be incorporated into an individual’s current lifestyle to help develop a healthy eating style that can be maintained. MyPlate, MyWins meets people where they are and helps to build healthier eating habits, rather than setting unrealistic goals. MyPlate provides numerous resources to support individuals’ efforts to make small changes across a variety of behaviors. MyPlate, My Wins allows personalization of goals and eating habits to create real solutions that work. Consumers often turn to nutritionists and health professionals for solutions to improve health and eating behaviors. To help prepare for this surge of attention on healthy eating that comes with the beginning of a new year, MyPlate has released a toolkit designed for health professionals. The toolkit contains resources to empower individuals to make healthy eating choices and turn their resolutions into real solutions. For maximum impact, consumers need to hear messages from multiple sources in a variety of environments. The MyPlate Message Toolkit amplifies MyPlate messages through social media, creative graphics, and more. Health professionals can easily incorporate the ready-to-use resources into their existing nutrition education and client nutrition information. Whether you are a nutritionist, health professional, or someone interested in tapping into the enthusiasm of creating a healthy lifestyle in January, turn to MyPlate for nutrition tools to help make a healthy eating style that will last throughout the entire year. Find the toolkit at choosemyplate.gov/toolkit and visit ChooseMyPlate.gov for a variety of free online resources, such as tip sheets, infographics, and more. Also, be sure to follow @MyPlate on Facebook, Twitter, and Pinterest, and sign up for MyPlate email updates at ChooseMyPlate.gov/govdelivery. Please allow the supertracker to be flexible as to the specific categories so that people with medical conditions can use it. In my case I need to increase vegetables and reduce whole grains. My protein intake needs to be more plant based. I can not follow my medical plan dietary needs under the supertracker because the categories are not flexible for formulation of my meal plan. Are there any plans to create a program encouraging the over 40 million people on food stamps to take advantage of the benefits of buying healthy food with their monthly allocations? I think this can be done on a voluntary basis but the USDA should provide the information and make it available to all food stamps and WIC recipients. Here in GA, one of the most popular food stamps blogs (http://igeorgiafoodstamps.com) barely touches on how to eat healthy and even the state's food stamps website (https://dfcs.georgia.gov/food-stamps) has very little on the topic. @wnorthen46 - You may find helpful information on profile access and management in the SuperTracker User Guide. Visit https://www.supertracker.usda.gov/userguide.aspx for more information. If you need additional assistance, please email SuperTracker customer support at SuperTrackerHelp@cnpp.usda.gov.